The baseball world has been buzzing regarding a potential new surgery to repair the Tommy John ligament, rather than the traditional reconstruction, that has the potential to reduce the time to return from surgery. The new procedure involves repairing the damaged ligament and reinforcing it with a collagen-coated fiber tape in contrast with the traditional UCL reconstruction that involves drilling tunnels in the bone and using a graft from a tendon in your arm or leg. The new UCL repair with internal brace is less invasive and offers hope that the new procedure can reduce the time it takes to return from surgery while providing similar effectiveness of the traditional procedure. The following presentation by Dr. Jeff Dugas from ASMI in Birmingham, AL, discusses the procedure, early results, and what we currently know about the procedure. Dr. Dugas is one of the pioneers of the new procedure. Is The New Procedure a Miracle? The mainstream media has been calling the new UCL repair with internal brace procedure “the next miracle,” but like everything else, we need to take what we read in the media as entertainment, not fact. The media loves to sensationalize a topic, and this is no different than what is occurring with the new procedure. The truth is that this procedure is still new, although promising. Results are coming in and have been satisfactory to date, but realize that very strict patient criteria has been used so far to date. We do not have a very large sample size of higher level baseball players just yet, though they are coming. Furthermore, we do not have long term data. Short term data appears promising, but we have a saying in scientific research, “if you want to report good results, just look at short term data.” We don’t know the longevity of these repairs and if they prove to be as reliable and durable as UCL reconstruction. So until we have a larger sample of data and a longer follow up time to analyze the effectiveness, the procedure should still be considered experimental at this time. The traditional Tommy John procedure, which is more invasive and reconstructs the UCL ligament, is still the current gold standard with decades of research supporting it’s effectiveness. Who’s a Candidate for The New Alternative to Tommy John Surgery? While the traditional Tommy John reconstruction will likely remain the gold standard for some time, there are some people that may be great candidates for the new alternative UCL repair with internal brace procedure. Younger baseball players with open growth plates can not perform the traditional procedure as it involves drilling of the bones in the arm and may impact the growth plate. Baseball players with strict timelines, such as a college or high school baseball player going into their senior year, may also be good candidates. Other athletes, such as gymnasts, football players, and those that have had a traumatic injury to the UCL may also be good candidates. I recently spoke with Dr. Dugas about this exact topic. As he has gained more experience with the procedure, we’re getting better at determining who is NOT a good candidate. It really comes down to tissue quality. If you have been wearing your ligament down for some time with past episodes of elbow pain or even ligament sprains, the tissue quality is probably not good enough to support the repair. In addition, if you have boney changes in your ligament, such as ossicle formation from chronic stress and past injuries, the tissue quality is likely not adequate enough to support the procedure. In fact, Dr. Dugas told me he is going into these procedures telling the patients that they may wake up and have had the full Tommy John reconstruction. When they get in the elbow, they may feel the tissue quality is too poor. But with time and experience, they are finding they are doing well figuring this out based on the x-rays and MRI prior to surgery. At this time, I am personally finding it hard to recommend this new procedure for most baseball players. I’m never a fan of adopting newer or experimental procedures when a option with good results and reliability exists. The traditional Tommy John procedure is still my first recommendation for players that wish to continue their career development. I hope in the future my opinion changes, as the hope of returning pitchers to baseball sooner than a traditional Tommy John procedure is exciting. I do believe this is just the beginning. New procedures, techniques, and biological advancements will emerge and our management of baseball pitchers with Tommy John injuries should only continue to improve. EBP has just released an online version of the 2017 ASMI Injuries in Baseball Conference, featuring world renowned speakers such as Dr. James Andrews, Dr. Glenn Fleisig, Kevin Wilk, Mike Reinold, and several MLB team physicians, athletic trainers, and strength coaches. This is the premier conference for baseball related injuries and performance enhancement, with topics detailing pitching biomechanics, baseball specific functional anatomy, clinical examination, surgical management, injury rehabilitation, and performance enhancement for baseball players. The course contains the most cutting edge information from the leaders in baseball sports medicine, including the above presentation by Dr. Jeff Dugas. 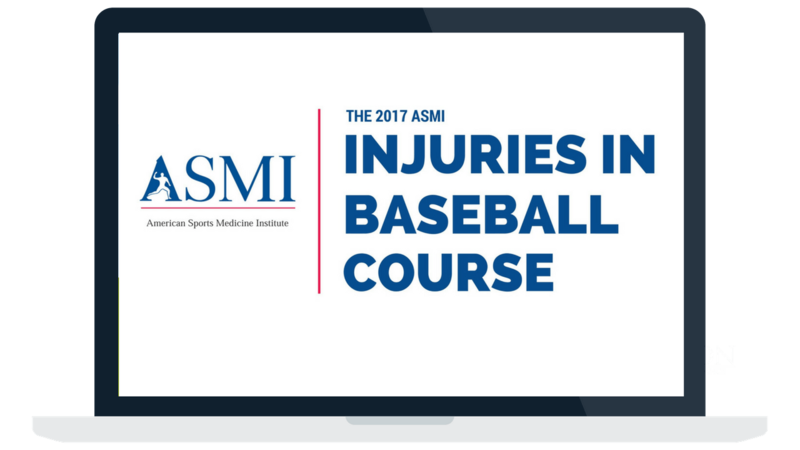 The ASMI Injuries in Baseball Conference has been on sale this week for $100 off, but there are only a few days left to save! The sale ends Sunday June 25th at midnight EST. Click the button below to learn more. Is Rotator Cuff Strength the Key to Preventing Tommy John Injuries? I like simple studies that answer complex answers. A recent report in the International Journal of Sports Physical Therapy has shown the baseball pitchers with Tommy John injuries have weaker rotator cuff strength than healthy players. 7% deficit in ER rotator cuff strength compared to their non-throwing arm. Healthy players had no deficit between their shoulders. 30% deficit in ER rotator cuff strength compared to the throwing arm of healthy players. So, players with Tommy John injuries were weaker in general and showed specific throwing arm weakness. I’ve always said that shoulder strength and mobility is the key to reducing these Tommy John injuries, these results completely support the need for rotator cuff strength. So it’s pretty obvious that we should be performing a shoulder program. I’ve recently put together a free arm care program for EBP that you can perform to get your shoulder and forearm strong, and hopefully prevent some of these Tommy John injuries. Background: Ulnar Collateral Ligament (UCL) tears are common in baseball players. Alterations in rotator cuff strength are believed to be associated with injury to the shoulder and/or elbow in baseball players. Hypothesis/Purpose: Baseball players diagnosed with a UCL tear will demonstrate decreased internal (IR) and external rotation (ER) force as an indication of isometric muscular strength in the throwing arm compared to IR and ER force of the throwing arm in healthy baseball players. The purpose of this study was to examine isometric IR and ER strength of the shoulder in baseball players with UCL tears at the time of injury compared to healthy baseball players. Methods: Thirty‐three of the participants were diagnosed with a UCL tear and thirty‐three were healthy, age‐ and positioned‐matched controls. All of the participants played baseball at either the high school or collegiate level and volunteered for the study. Isometric rotator cuff strength measurements for internal (IR) and external rotation (ER) were performed with the arm held to the side at 0 ° of shoulder abduction. All measurements were taken bilaterally and the means of the throwing and non‐throwing arms for IR and ER in the UCL group were compared to the means of the throwing and non‐throwing arms in the healthy group. One‐way ANOVAs were used to calculate differences between groups (p < 0.05). Results: Baseball players with UCL tears demonstrated significant rotator cuff strength deficits on their throwing arm IR (p < .001) and ER (p < .001) compared to throwing arm IR and ER in the Healthy (UCL IR = 131.3 ± 31.6 N; Healthy IR = 174.9 ± 20.7 N) (UCL ER = 86.4 ± 18.3 N; Healthy ER = 122.3 ± 18.3 N). On the non‐throwing arm, the UCL group was weaker in both IR (135.0 ± 31.1 N; p < .001) and ER (93.4 ± 22.8 N; p < .001) than IR (172.1 ± 24.1 N) and ER (122.3 ± 19.1 N) in the Healthy group. Conclusion: Participants with a UCL tear exhibit lower force values as an indication of isometric rotator cuff strength in both the throwing and non‐throwing arms than a healthy cohort. Int J Sports Phys Ther . 2015 Aug; 10(4): 476–481. BASEBALL PLAYERS WITH ULNAR COLLATERAL LIGAMENT TEARS DEMONSTRATE DECREASED ROTATOR CUFF STRENGTH COMPARED TO HEALTHY CONTROLS Copyright © 2015 by the Sports Physical Therapy Section Abstract Background Ulnar Collateral Ligament (UCL) tears are common in baseball players. https://elitebaseballperformance.com/wp-content/uploads/2017/02/EBP-Research-Review.jpg 512 1024 Mike Reinold http://Elitebaseballperformance.com/wp-content/uploads/2016/12/ebp-green-transparent-horizontal-logo-300x96.png Mike Reinold2017-03-30 06:00:392017-03-24 14:09:03Is Rotator Cuff Strength the Key to Preventing Tommy John Injuries? A report from the Kerlan-Jobe clinic, published in the Journal of Shoulder and Elbow surgery, has found that pitchers with a large increase in innings pitched follow Tommy John surgery are most at risk to have another injury that may require a second Tommy John revision procedure. As Tommy John injuries continue to side in Major League Baseball, we are starting to now also see a rise in failures that require a second procedure. Pitchers that required a second surgery pitched in more games, threw more innings, and threw more pitches than a group of pitchers that did not require a second Tommy John revision. Conversely, pitchers that did not go on to needing a second procedure pitched less games, threw less innings, and threw less pitches. The results of this study show workload and overuse may be contributing factors to failing Tommy John surgery. Furthermore, it may be advantageous to intentionally reduce workload in the year following Tommy John surgery to reduce the risk of failure. Keller RA1, Mehran N2, Khalil LS3, Ahmad CS4, ElAttrache N2. J Shoulder Elbow Surg. 2017 Mar;26(3):369-375. doi: 10.1016/j.jse.2016.11.045. 2Kerlan-Jobe Orthopaedic Clinic, Los Angeles, CA, USA. 3Wayne State University School of Medicine, Detroit, MI, USA. 4Center for Shoulder, Elbow, and Sports Medicine, Department of Orthopaedic Surgery, Columbia University, New York, NY, USA. With an increasing number of Major League Baseball (MLB) players undergoing ulnar collateral ligament (UCL) reconstruction, there remains limited literature on appropriate post-reconstruction workload management to limit the risk of reinjury. A total of 28 MLB pitchers who underwent primary UCL reconstruction surgery and subsequently required revision reconstruction were identified and compared with 137 MLB pitchers who underwent primary reconstruction but did not later require revision surgery. Games pitched, pitch counts, and innings pitched were evaluated and compared 3 years before and after primary reconstruction. Results were then compared between groups. Pitchers who later required revision increased their games pitched by 14.1% after reconstruction whereas the no-revision group pitched 13.6% fewer games than before reconstruction (P < .01). Inning workload was reduced by 9.8% after surgery (89.8 innings after vs 99.6 innings before) for the revision group compared with the no-revision group, which threw 26% fewer innings after surgery (86.3 innings after vs 116.7 innings before) (P = .05). In addition, the revision group pitched 6.6% more pitches after reconstruction, 1138.9 pitches, compared with before reconstruction, 1068.6 pitches. Pitchers who did not require revision, in contrast, pitched 19.6% fewer pitches after reconstruction than before reconstruction (P = .08). This study’s findings suggest that MLB pitchers who require revision UCL reconstruction after returning to play following primary UCL reconstruction pitch at or above their pre-primary UCL reconstruction workload whereas control pitchers who do not require revision pitch significantly less, below their pre-primary UCL reconstruction workload. Copyright © 2017 Journal of Shoulder and Elbow Surgery Board of Trustees. Published by Elsevier Inc. All rights reserved.